A professor's life is disrupted by the arrival of new tenants in the apartment upstairs. A relic of classic Hollywood, the sturdy and stoic Lancaster is ideally cast, standing out among the Fellini-esque interlopers like a Harold Robbins paperback on his cultivated bookshelves, but while Visconti's point is made clear, it feels like an old man chewing on sour grapes to spite his tongue. Between the '50s and mid '70s, Italy boasted the greatest film industry outside of Hollywood. American stars were drawn to star in Italian productions, eager to work with that country's acclaimed auteurs. Clint Eastwood launched his career as the face of Sergio Leone's Dollars trilogy; tired of Hollywood, Marlon Brando worked under Bertolucci and Pontecorvo; Burt Lancaster lent some good old American star power to a pair of films by Luchino Visconti - 1963's much lauded The Leopard and 1974's less well received and even less well remembered Conversation Piece, reissued now in a gloriously grainy hi-def transfer by the Eureka Masters of Cinema label. In his second Visconti collaboration, Lancaster essays an American professor, living in comfortable retirement surrounded by books and paintings in a cosy Roman apartment, a quiet oasis of mahogany and Mozart in a city of steel and stone. His world is turned upside down when he's slyly coaxed into renting out the apartment upstairs, home to more of his books, by the brash Marquise Bianca Brumonti (Silvana Mangano). 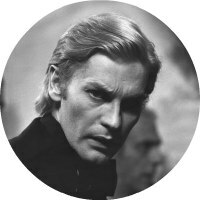 Immediately, she moves her German toy-boy, Konrad (Helmut Berger), into the lodgings, and the young man sets about tearing the place apart, causing damage to the Professor's apartment below. Later, he is joined by the Marquise's teenage son Stefano (Stefano Patrizi) and daughter Lietta (Claudia Marsani). A sort of reversal of the dynamic of Jean Renoir's Boudu Saved from Drowning, Conversation Piece starts out as a culture clash comedy, before sinking gradually into a melancholic and moapy haze. The latter aspect isn't quite so successful as the former. Through Lancaster's grumpy aging protagonist, Visconti delivers a "get off my lawn" message that seems to be directed at Italian cinema as much as the new found liberalism of Italian society. A relic of classic Hollywood, the sturdy and stoic Lancaster is ideally cast, standing out among the Fellini-esque interlopers like a Harold Robbins paperback on his cultivated bookshelves, but while Visconti's point is made clear, it feels like an old man chewing on sour grapes to spite his tongue. Made in 1974, an exciting time for Italian cinema, even if global acclaim was beginning to fall silent, Conversation Piece resembles a movie made a decade and a half earlier. Yet for all its elegant composure, it has little of interest to say about the Italy of the '70s, the era of the "years of lead" and giallo cinema, and with its strained dialogue, even less worth listening to. 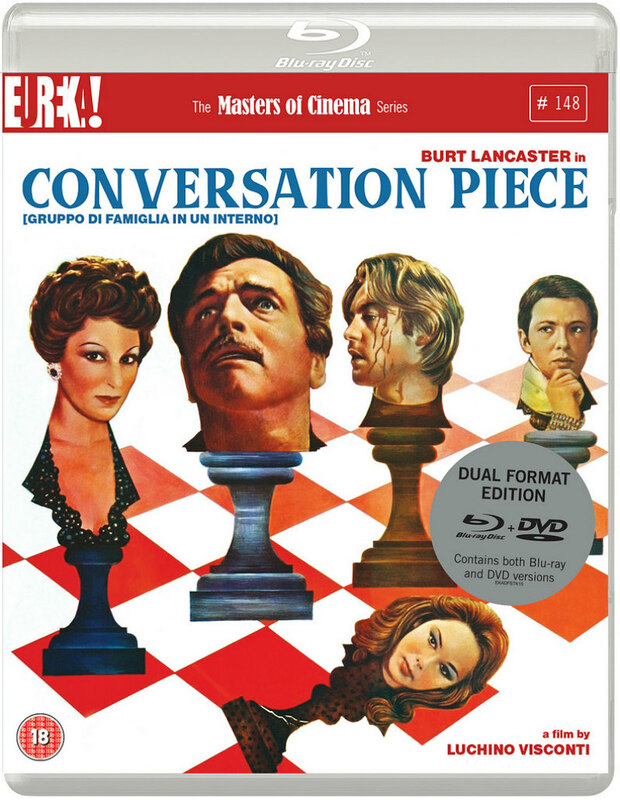 The disc offers both the original English language track and an Italian dub with English subs, a trailer, an interview with critic and screenwriter Alessandro Bencivenni, and a booklet featuring a new essay by Pasquale Iannone. 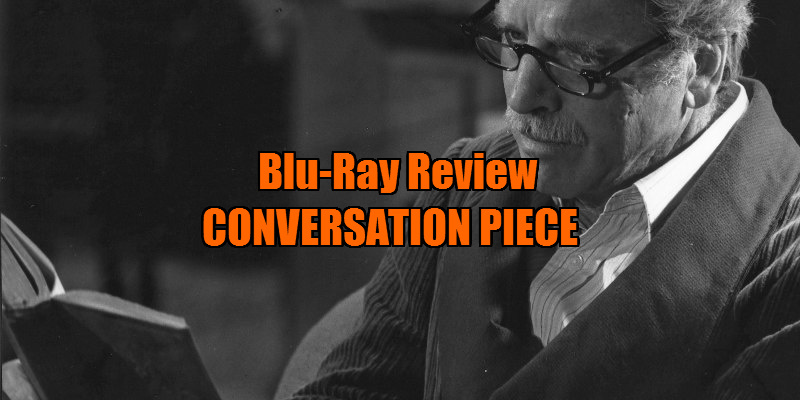 Conversation Piece is available on dual format blu-ray and DVD now.